Since the early 1900s, American's proclaimed corned beef and cabbage to be their favorite Irish dish, even though it really never have graced dinner tables in Ireland. Since then, Americans has embraced it as the meal of choice for St. Patrick's Day, March 17. 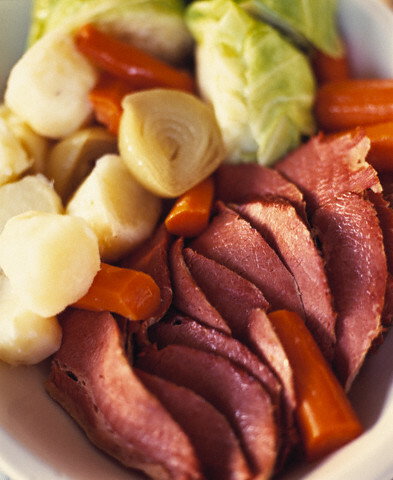 Corned beef got its name before refrigeration, when meat was preserved using coarse grains of salt, called 'corn'. Today, beef is corned with spices strictly for flavor, not for preservation, so the meat must be refrigerated. Whether you're a wee bit Irish or not, boost your luck by celebrating St. Patrick's Day with friends and a feast.